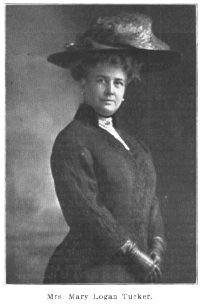 Mrs. Mary Logan Tucker, the daughter of Gen. John A. Logan, was an active member of the Illinois State Association and the Illinois State Society of Washington, DC from about 1889 until her death in 1940. She was present in 1930 when Iowa Circle, NW was renamed as Logan Circle, NW in honor of her father. She also served for a time as the president of the Dames of the Loyal Legion and her last lecture to members of the Illinois State Society was in 1938. She is buried in the Logan Tomb on the grounds of the Old Soldiers and Sailors Home in DC.